The MSR Fury. A spacious tent. I’ve talked previously about how MSR makes a great line of tents, and the MSR fury certainly fits in with its tradition. 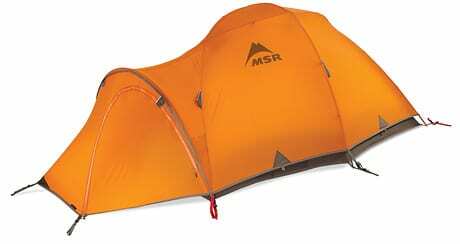 Yet the MSR fury is also tent that has created some controversy because of the fact that it is not very easy to pitch and is not as user-friendly as it might be. Even so, this is a tough tent made with great materials and so improved immeasurably overtime. It is also relatively lightweight, weighing in at 2.8 kg, or just six pounds and 4 ounce it is also relatively roomy inside given its small sizes. The inner itself is freestanding, so you have the otion on clear and beautiful days of just pitching the inner without the fly sheet to keep the bugs off you (though frankly, in conditions like that I just prefer to sleep right out in the open and to see the stars directly). It is also a genuine four-season tent and should withstand strong winds and heavy snow. Its also capable of withstanding tough storm conditions on most mountains, making it genuinly expedition grade. The older versions require you to thread the poles through fabric loops. That’s just time-consuming and clumsy. The newer ones have pole clips that work great and are nice and quick to use when pitching the tent. What do others say about the MSR Fury Tent? I Owned this tent for a 6 month trip in the Andes, and used it from sea level to 5700m. camps. This tent is just Great : Incredibely resistant, spacious, bright inside, small footprint, beautifull (in my opinion) ! I would recommend it for all conditions mountaineering and winter trekking. At TrailSpace.com it also gets pretty good reviews. teh only real gripe that people had was its weight (though to be honest, it is tough finding a strong, 4 season tent that weights much less – also note that the tent has come down in weight over the years and is also a lot easier to pitch in its current configuration). Anyhow, most give it 4 or 5 stars on the Trailspace rating. I’ve noticed some of the reviews of this tent rate it poorly and I have to disagree. The tent is as solid a 4-season tent as you’re going to get. It’s not made for giving you creature comforts when backpacking, like enough headroom for two to sit and chat. The headroom was sacrificed for a good wind profile, so that when you’re stuck in your tent in a nasty storm(read wind, snow and sleet…not rain), it won’t blow apart on you. I’ve had this tent for 3 years now and have loved it, using it in BC and the Yukon. That said, I don’t use it in the summer cause it doesn’t vent as well as other tents and weighs more. For climbing and ski trips, it’s one of the best. There’s enough room for two adults and two midsize packs inside. The Fury is a versatile four-season performer capable of everything from ski mountaineering to high alpine ascents. Our only complaints lie with a lack of support in the rear sidewalls and its heavy and impractical stuff sack. We recommend the Fury over the company’s Asgard ($580, 8 lb. 8 oz.) because it has better ventilation (less condensation and safer for cooking), larger and more varied pockets, and a vestibule that is easier to open and close and better to cook in. They also have an awesome video review that really gives you a great sense of the tent.